One of the trailheads for the History Trail at Watchung Reservation, near the Trailside Nature and Science Center. Well, now, trail heads, you’ve probably been wondering where your trail head in chief has been this winter. I wish I could tell you that I was off on a long-distance hike in Australia or South America, or perhaps off on a mountain-climbing expedition in the Rockies or the Pyrenees. But the truth of the matter is, between some ghastly weather in New Jersey this winter, a transition into a new job and not one but two graduate school classes this winter and spring, my hiking time has been severely curtailed. And by extension, so has my blogging time. This weekend, having finally caught up on some things, I packed up my water bottle, binoculars and copy of “Birds of Eastern North America” and headed someplace I’ve not hiked yet: Watchung Reservation in Union County. Tripod Rock, a glacial erratic consisting of a giant boulder perched atop three smaller rocks, is one of the most popular natural features on Pyramid Mountain. How has Tripod Rock not fallen over after all these years? That was my first thought upon coming across said natural feature at the top of Pyramid Mountain. And if you’ve ever visited Tripod Rock, that has doubtless been one of your first thoughts as well. That is exactly what it is: a giant boulder perched atop three smaller boulders, deposited there millennia ago by a moving glacier during the Ice Age. The technical term for it, as I understand, is a glacial erratic. And there it has stood, weathering the ravages of time, storms and probably more than one would-be-vandal. I actually saw a couple of kids and parents who were gutsy enough to go crawling around in the space underneath the main boulder, all the better for taking selfies. I myself would be a bit squeamish about having that much tonnage of rock directly above me. So, Erin, you may ask, tell me more about where I might find this mammoth Mesozoic monstrosity? Well, sit ye down, children, and I’ll tell you all about it – and some other cool features besides. I like learning new skills to bring with me when I’m out hiking – how to box a compass, how to recognize different kinds of plants, how to geocache. And now, your blogger-in-chief is taking an interest in birdwatching. Some bird watchers are experts; I am of the “I can recognize robins, cardinals and finches, but for anything else I have to go looking through the guidebook” level of birdwatching skill. Why do so many people enjoy birdwatching? Birds are beautiful (though some might beg to differ in the case of, say, a vulture), often entertaining, and most importantly, vital to a functioning ecosystem. Basically, if you don’t have birds, then you’ve got a serious problem. After all, that’s where Rachel Carson got the title for “Silent Spring;” she noticed, one day, that there weren’t any birds singing. And birdwatching gives you a sense of how many of what kinds of species there are. The view from the wildlife observation deck off the orange trail at the Great Swamp Outdoor Education Center. I always figured that Vermont and Canada had pretty much cornered the market on maple syrup. Which is pretty much the case. But New Jersey has a maple sugaring season, too – granted, around here it’s much shorter than it is to the north. I learned a few things about maple sugaring in late January, when I headed down to the Great Swamp Outdoor Education Center in Chatham for a short group hike and a maple sugaring demo. The center, near where Essex, Union and Morris counties come together, is part of the Great Swamp National Wildlife Refuge. Happy May, trail heads. Now that I finally have that project for graduate school safely dispatched and out of my hair, I’m going to talk about a rail trail hike that I managed to squeeze in back in April. “You’ve got to check this out for the blog,” my mother kept telling me over the phone this winter. 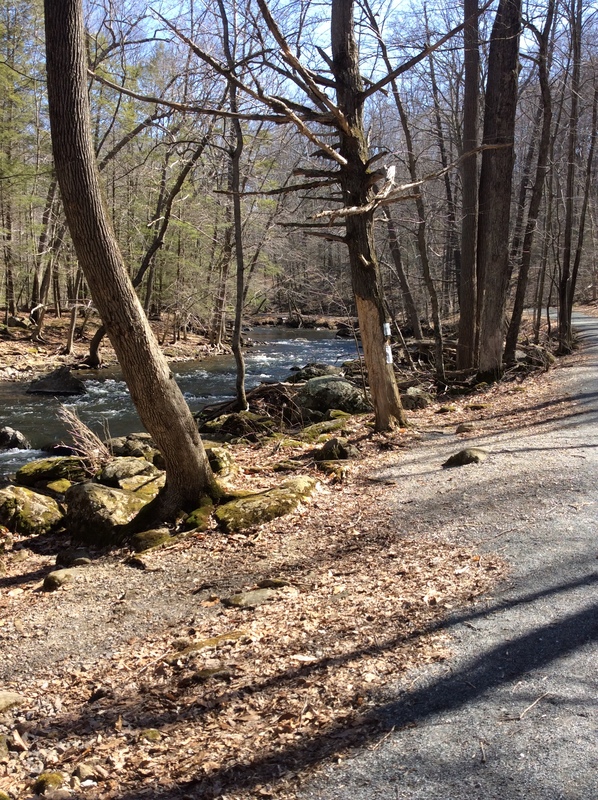 “This” was the Columbia Trail, a rail trail that runs through a good chunk of Hunterdon County in western New Jersey – very close to where my mom’s family lived for a time and where my grandmother still hangs her hat. I think a lot of us might have a story like this from some point in our lives or other. I remember one time, when I was 12 or 13 or so, going out for a bike ride one Saturday morning. As I was rounding the corner, a car – might have been a pickup or an SUV – came driving by, and the occupant (not sure if it was the driver or a passenger) pitched a beer bottle out the window. It landed on the street and shattered, about five feet in front of me (and my bike tires). Needless to say, I was pretty miffed. One of the wildlife viewing platforms on the Rodak Nature Trail at the Eagle River Nature Center. I was born in Alaska, in Anchorage to be exact. It was in those days, you see, that my family belonged to a tribe of nomads known as the United States Air Force. Dad was a flight surgeon stationed at Elmendorf AFB – now Joint Base Elmendorf-Richardson. We moved back down to the lower 48 (that’s the continental United States to the rest of you) in the summer of 1989, when I was three years old. So my memories of Alaska from those days aren’t as clear as the rest of the family’s, but I do remember some things – the house we lived in on Foxhall Drive, for example. Last year, like salmon returning to the spawning grounds (and trying not to get eaten by a bear in the process), we came back to Alaska for the first time in 24 years so we could make some new memories – including a couple of hikes up around the Eagle River Nature Center in Chugach State Park. Back Bay National Wildlife Refuge: Virginia Beach, Va.
A view from the Bay Trail. If you’re going to the Back Bay National Wildlife Refuge, it is highly recommended (especially by me) that you bring a compass and/or a GPS unit. Not for use inside the refuge itself, mind you – the real navigational challenge is just finding the place. Getting there involved a rather loopy ride through the Princess Anne section of Virginia Beach, down to Sandbridge Road. But enough about the loopy rides to the refuge – let’s talk about loop hikes in the refuge instead. The main part of Back Bay – the section with the ranger station, visitors’ center and trails – is found on the sliver-thin barrier islands in Virginia Beach, just north of the Virginia-North Carolina state line. The rest of the refuge is spread out over several small islands and some pockets of land on the Virginia Beach mainland itself. 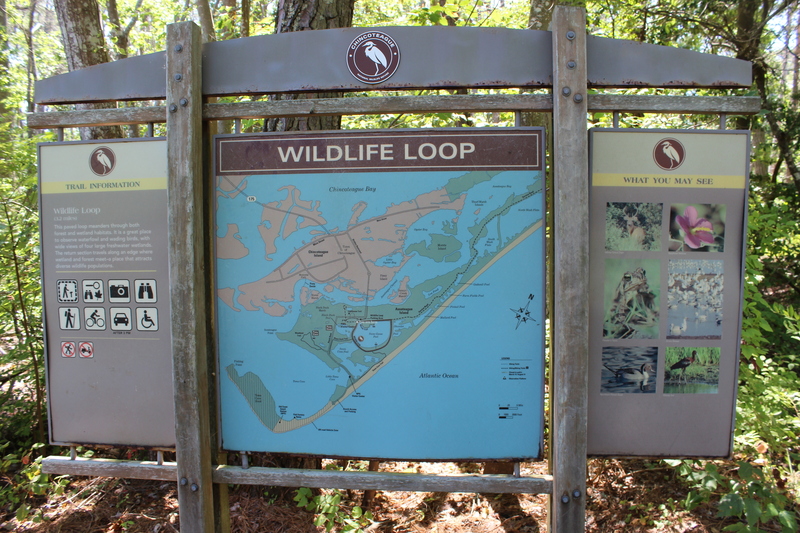 Chincoteague National Wildlife Refuge trails – Chincoteague and Assateague Islands, Va. Trail map for Wildlife Loop. Most people come to Chincoteague Island, Va., and neighboring Assateague Island for two reasons: the beaches, and to try to get a glimpse of the ponies. Even if you’ve never read Marguerite Henry’s “Misty of Chincoteague” (confession time: I still haven’t), you’ve probably heard about the Chincoteague ponies at some point or other. Granted, the beaches and the ponies are good reasons to come to the islands. But there’s more to the place than beaches and ponies. 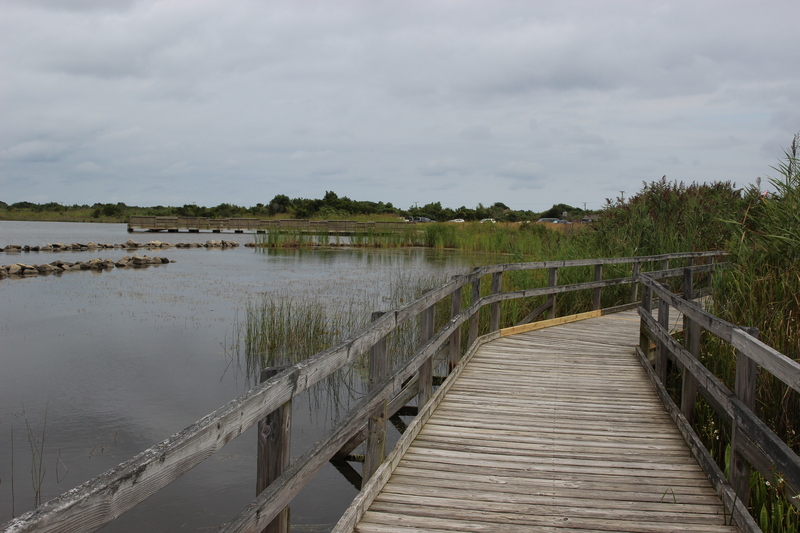 The islands are home to the Chincoteague National Wildlife Refuge – which have several trails for walking and biking. By now, probably just about everyone in northern New Jersey – and just about everywhere else, judging from all the talk show jokes – has heard the story of the 16-foot anaconda that was rumored to have been out swimming in Lake Hopatcong. The DEP has been hunting for the snake for the last few weeks. But today, the agency announced that they’re calling off the search, saying that there’s no concrete evidence that such a snake even existed. You can read the full story from NJ.com here. You can read Jane’s story here. quickly becoming An Old Broad in Boots!